Company: Jinan Evershining CNC Machine Co., Ltd.
Use: Ideal equipment for linking & straightening of steelpipe. The machine installs main oil-cylinder on the upper, individually equips one clamping cylinder on the two sides, clamping cylinder may go up & down which can realize linking of various steelpipe with diameter between 500 and 1500mm by using lengthened bar. Install electric driving roller at the front & rear to decrease the working strength of workers. 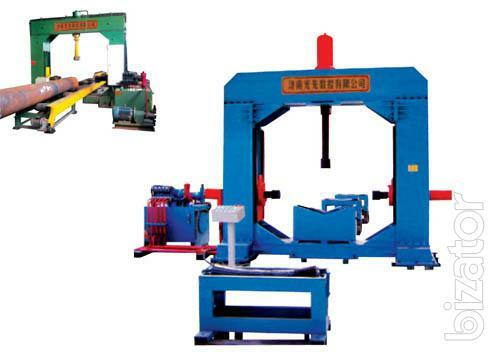 The machine may install front & rear support frame to straighten steelpipe, one machine with two functions. Already gotten China national patent. Jinan Evershining CNC Machine Co., Ltd. belongs to joint-stock company, which is also high-tech enterprise certificated by Ministry of Science & Technology, P. R. C. There are more than 108 employees in our company at present, and the factory covers 36, 000 sq. m...We mainly engage in development, manufacture and sales of Automation equipments for steel tower & steel pipe tower and other optical, mechanical and electronic integration equipments, which timely and promptly track international new technology to replace imports and innovate upon traditional industry with information technology for improving national industry. We sincerely hope to get the greater achievements with our new and old customers together, complying with First Quality, Best Service to try our best efforts to be a pioneer in optical, mechanical and electronic integration equipments. Among our products, Automation punching, drilling, marking & shearing line for angles, Automation plates punching, drilling & marking machines, Automation fire-bending machines for angles & plates model APB2060, Automation corner cutting machine for angles, hydraulic opening & closing machine for angles model KH140, Automation angles straightening machine, DZ series hydraulic marking machine for angles & plates, PK series plates beveling machine, Q35Y series punching & shearing machine, Automation steel pipe & flange welding machine, hydraulic linking & straightening machine, Automation flange drilling machine, Automation plates drilling machine, all of these are ideal Automation complete equipments specially used for steel tower and steel pipe tower. The above not only fill up the domestic market blank but also get a good performance which reaches or approaches the levels of developed countries such as EEC, America, Japan, etc. To ensure the reliability and stability of equipments, the important components adopted to our machines are imported from abroad, such as Automation system, servo motor, encoder, linear guide, ball-screw, hydraulic and pneumatic elements, etc. To ensure operation convenient, all the Automation equipments have been performed transformation from CAD to CAM directly, which saves many programming operation and realizes automatic production without drawings. Simultaneously, some functions including real time monitor and remote diagnosis are very convenient to make our after-service timely and promptly in 24 hours. Besides the above we referred, we also design and manufacture many kinds of specialized Automation equipments and automatic production line by request, such as hydraulic multi-station processing machine, etc. At present, we already had more than 300 customers in China and more than 500 sets of Automation equipments are in good using. Sincerely hope you make an inquiry at any time if need. Keep in touch with us, please! we have products as follows: Automation punching, drilling, marking & shearing line for angles, Automation plates punching, drilling & marking machines, Automation fire-bending machines for angles & plates model APB2060, Automation corner cutting machine for angles, hydraulic opening & closing machine for angles model KH140, Automation angles straightening machine, DZ series hydraulic marking machine for angles & plates, PK series plates beveling machine, Q35Y series punching & shearing machine, Automation steel pipe & flange welding machine, hydraulic linking & straightening machine, Automation flange drilling machine, Automation plates drilling machine, all of these are ideal Automation complete equipments specially used for steel tower and steel pipe tower.